Voodoo Queen Daiquiri Dive open up. Photo By Beth Levine. It’s been a long wait for Voodoo Queen at 322 Milby on Houston’s east side to make a comeback after a fire temporarily put them out of business. That was almost two years ago. 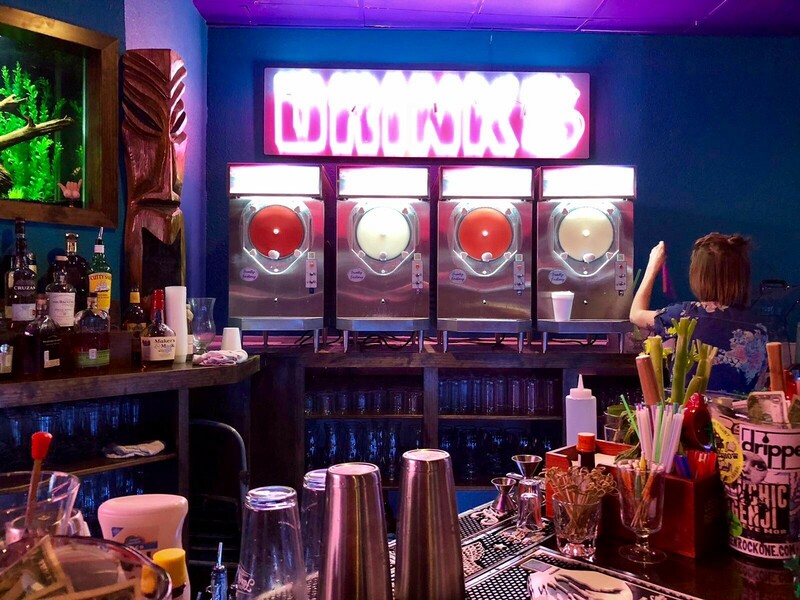 Finally, a bigger and brighter Voodoo Queen Daiquiri Dive officially reopened on Wednesday, March 14. Thanks to the rebuild, Voodoo Queen is now much more spacious. Owner Brandon Young (also of Moon Tower Inn) and team expanded to the space next door and the result is a much more open floor plan. It also has a brighter look thanks to a new paint job. 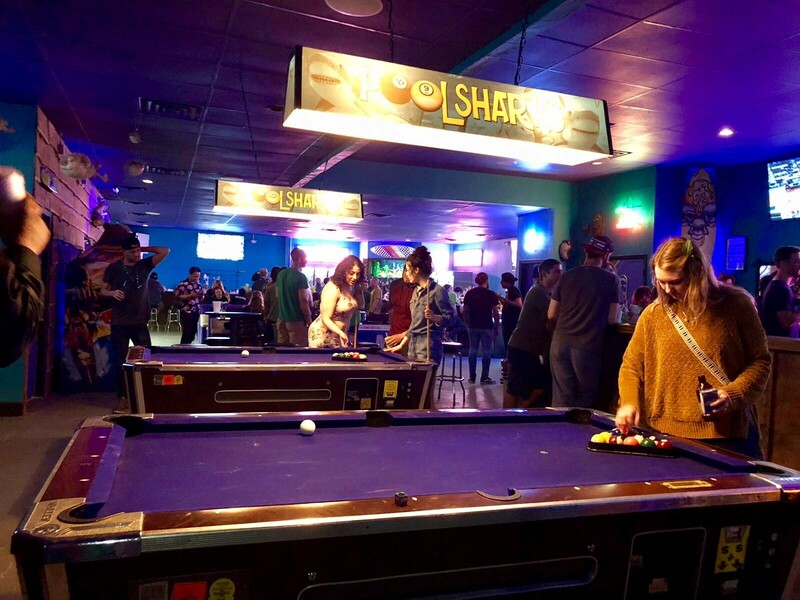 The extra room also allows for additional pool tables, two bars, an expanded kitchen and a lot more seating, including on the patio. 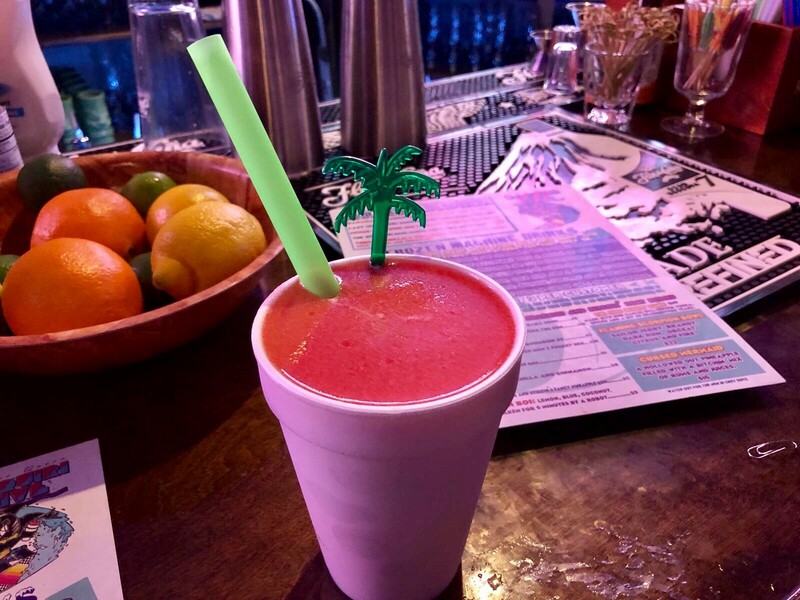 The new-and-improved Voodoo Queen Daiquiri Dive also has a more relaxed vibe. The Tiki-surfer-bar atmosphere even sports cheeky ’80s posters in the bathroom, like one of Tom Selleck from his Magnum P.I. days. While the edgy pentagram that adorned the outside of the building is no more, there’s still a fish tank and plenty of pirate decor to go around. One of two frozen daiquiri stations. Photo By Beth Levine. Technically, Voodoo Queen is still in its soft opening phase, so the menu isn’t finalized, but there indications that it’s much more of a full-fledged selection than before. The temporary VQDD Kitchen menu includes Da Po’ Boys with meat choices of roast beef, fried shrimp, andouille sausage, grilled chicken or BLT-style. All are dressed with shredded lettuce, tomatoes and the dive’s “one-drop sauce.” Po’ boy prices range from $6.95 to $11.95. There’s also a chicken strip basket for $9.95 and The Big Easy—fresh crinkle cut french fries (or tater tots) smothered with American cheese, roast beef debris, cheddar cheese, fresh onions and one-drop sauce (we sent an inquiry to the owners to find out just what was in this sauce, but until then you’ll need to find out for yourself)— for $10.95. Sides of plain fries, tater tots and hushpuppies are also available. The Basic Betty at Voodoo Daiquiri Dive. Photo by Beth Levine. All frozen daiquiris are 16 ounces, $8 and, yes, you get to keep the cup. Do be warned that the decal-adorned cups are in high demand and go fast. After that, you get Styrofoam. For those more interested in handmade drinks, there are five, 22-ounce, hand blended daiquiris on the menu as well. That includes the cheeky Penus-Coladus, a piña colada favorite from the original menu with Fireball cinnamon whiskey that is even tastier the second time around. All hand-blended daiquiris are $12 each. The bartenders at Voodoo are not slouches when it comes to handcrafted cocktails, either. The Mai Tai, made from citrus, Cointreau, orgeat and Demerara rums, is one heck of a boozy cocktail with a slight smoky flavor that actually tastes even better as the ice melts. The Afternoon Harpoon is another doozy of a drink that features a lot of rum, even more citrus, self described “exotic fruits” with hints of vanilla and cinnamon. There are eight cocktails in total on the handmade section of the menu ranging from $7 to $12 each. Even though Voodoo Queen Daiquiri Dive is still in their soft opening phase, so far so good. Updated, 4:34 p.m.: We did hear back from Voodoo Queen with regards to our inquiries on some ingredients, “Sorry, we keep all of our recipes a secret. It’s part of the fun. Enjoy!”.